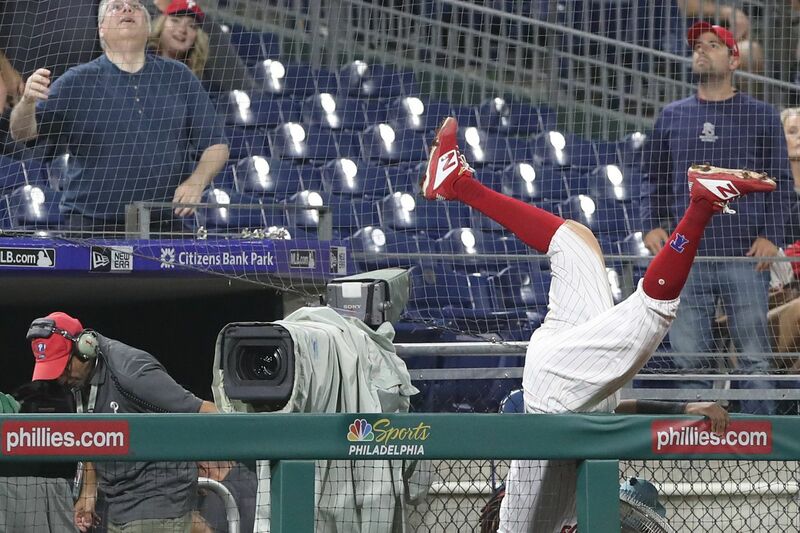 Phillies third baseman Maikel Franco flips over a railing as he goes after a foul ball hit by Adam Eaton of the Nationals in the eighth inning at Citizens Bank Park on Tuesday night. Maikel Franco watched the replay only once. "One time was enough," the Phillies third baseman said. "It was scary." Franco flipped over the railing in front of the visiting dugout while pursuing a foul ball in the eighth inning of Tuesday night's 10-inning, 7-6 loss to the Washington Nationals. He landed on his right shoulder and his neck, prompting immediate attention from trainers on both teams, but left the field under his own power. X-rays were negative and Franco didn't require a concussion test. His shoulder was bruised and sore, but overall he avoided serious injury. "I knew when I came down that I hit only my shoulder and the back of my neck," Franco said. "I didn't hit my head." The Phillies characterized Franco's condition as a jammed shoulder and a stiff neck. Manager Gabe Kapler said Franco could return to the lineup Friday. "We can joke about it today," Kapler said. "When I saw him sprawled out on the floor, he looked like his arms were spread out, his eyes weren't open. Is he alive? And there was quite a bit of panic from the umpire. But then once I saw him get up and start moving around, we were comfortable that it wasn't anything serious." Kapler also said rookie outfielder Roman Quinn will be available off the bench Wednesday night for the first time since he broke a bone in his toe last week. The Phillies were still trying to determine whether reliever Victor Arano (shoulder) will be available out of the bullpen for the series finale against the Nationals, according to Kapler.